Have you ever wondered how many posts get published each day? Over 1 million posts! Yes, that’s right! Just take a look at this amazing blogging statistics meter from worldometers.info. Now to achieve that, you will have to spent 20% of your time writing and 80% promoting what you wrote. And of course paid promotion does it part, but I am going to focus on unpaid promotion here. 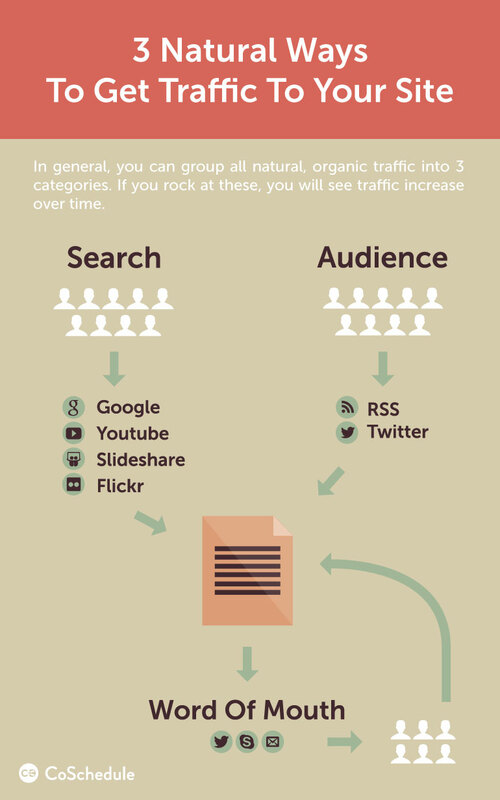 Just as you will observe in the sketch below provided by CoSchedule, there are 3 natural ways of increasing your blog traffic. ● Segmenting your audience in order to reach and convert each one effectively. Tip: Here you can highly benefit from having a landing page for each. I’ll just have to come out and say it straight: if really doesn’t matter how entertaining, valuable or actionable your articles are. If only a handful of people get to see it, you are not affecting anything, your traffic won’t go up, people will not benefit from your content and they will not convert like you want them to. So that being said, my advice is: use any means possible to get your content noticed (as long as those means fit into the best practice regulations of course, no one likes a spammer). Now when you write an article, you share it on all of your social media channels of course. As a first step in getting your content out there I strongly advise that you share your posts more than once. For example: On Facebook, Twitter and Google+ you can share your posts again after 2 weeks to be sure you’re being user friendly. And because you don’t want content to appear like spam, you should always use a different image and text when sharing. Most marketing bloggers will tell you to realize influencer roundup posts in order to persuade those influencers to link to that blog post. I am not going to argue with that because it’s the best thing you can do, a best case scenario. But until you get to that point, why not make the most of your relationship or connection with an influencer? There are more than one way to reap some good traffic and awareness from your influencers and I am going to start a list here that you are more than welcomed to continue (leave your ideas in the comments and I will happily include them in the post). ● You can guest blog on influencer sites so you can broaden your blog awareness. When choosing your influencers, reach out to those that have a big number of social media followers. You want them to share the post they write for you, or that you include them in, on their social media profiles. Even if you have to pay them to blog for you, the reach and the traffic directed to your blog if well worth it. In order to effectively find influencers, you can read this great article by Matt from Moz: The Power of Authors and Content for Link Building, using tools like BuzzSumo and Followerwonk. Just as I said earlier, we’re focusing on methods that don’t require pay, so instead of paying the influencers, you can offer them something they want. A service or a service - a barter as the economist say. ● Or give them free use of your products and tools, services. Optimising your blog articles for topic synonyms is still a very much alive game tactic. The reason for that: the Hummingbird algorithm brings the searcher results for the searched keyword and synonyms of that keyword as well. For example: If your article is optimised for “marketing strategies” and someone searches for “marketing tactics”, your result will show up thanks to the Hummingbird algorithm. But nonetheless, it helps to have variations of your topic in your article, because that will increase your relevance to the searched keyword or phrase, and your article will show up in the first search results. This is also a reason why optimising for long-tail keywords is important. And step 3: include them in your article. If you want to read more about the Hummingbird algorithm and how you can use SEO effectively, read: The Blogger's Guide to SEO from SEOBook, and this great SEO Ranking Technique article by Razvan Gavrilas from CognitiveSEO. ● Interact with people that comment on other blogs, in Q and A sites and forums. All you have to do is use your trusty Google to search for places where your target audience hangs out and you are halfway done. For some extra efficiency you can use the Google Display Planner to complete your list. 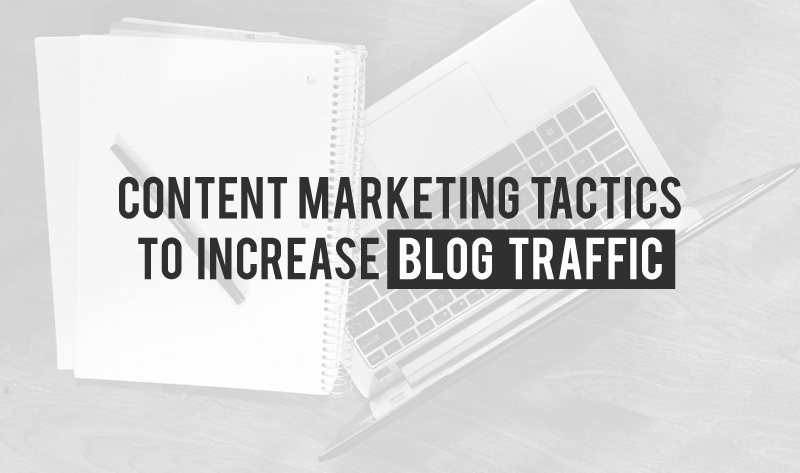 By engaging them, you bring attention to your blog. Create an account, read what others have written and by imitating the good behaviors, you get rewarded with traffic, trust and fans. Don’t just drop links, because that will grin negative effects like being banned and getting the reputation of a spammer. In your quest to get links, traffic and awareness, you must not focus so much on linking to important influencers that you forget to connect information from the article with other relevant articles you have written. You can do this by linking to articles in your content as well as displaying related posts at the end of your article. For example, a minimum of 3 related articles displayed will decrease your bounce rate and increase your traffic. If you want to further your knowledge about link building you can check out this link building guide from the guys over at backlinko. 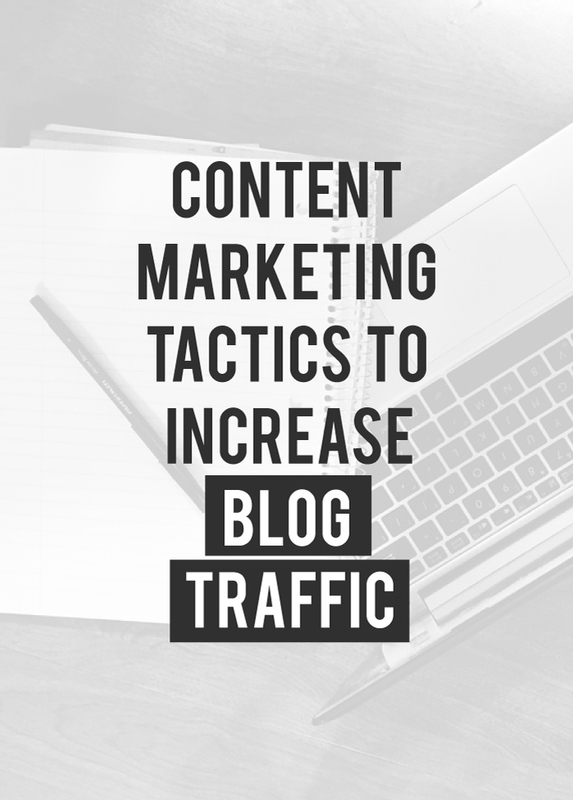 I am particularly fond of their Skyscraper Technique to drive traffic, which consists of identifying and improving existing content within your field that has already been shown to generate a lot of interest. BuzzSumo is a great tool for seeing content about a specific keyword that has been recently popular. ● Find a contagious idea, something that has a lot of traffic and add to it. ● Implement a newsletter signup pop-up on your blog. ● Put a link to your blog in your email signature. ● Optimize blog post images for sharing and SEO (alt tag, file size, share button, add a blog link to your photo description). And because we want that traffic to be used effectively, we are going to open another point of discussion with the help of this podcast from Jeff Bullas: What happens after you gain traffic? - Podcast: Turning traffic into sales.